Most years, we invite two interns to join us for the summer months. We are currently reviewing the applications we have received for the two summer internships in 2019 and are no longer accepting applications for this year. However, we encourage you to get in touch if you are potentially interested in internting in the coming years. With the Farmscape Ecology Program, Hawthorne Valley Farm, Ghent, NY. The Farmscape Ecology Program is dedicated to exploring the human and natural dimensions of the landscape in and around Columbia County, NY through research and outreach. The Program is part of Hawthorne Valley Association, an educational non-profit, and is comprised of a wildlife ecologist, a botanist, a social scientist, a conservation biologist, and a research technician. Our interdisciplinary research explores various dimensions of the historical, current, and potential future interactions of people with the land. An important part of our work is applied farmscape ecology, which involves documenting synergies between agricultural production and nature conservation, as well as creating, managing, and monitoring experimental on-farm habitats for beneficial wildlife. In 2019, we plan to conduct most of our applied farmscape ecology work on our home farm (Hawthorne Valley Farm) and at the Hudson Valley Farm Hub, but might also collect data on other regional farms. For the 2019 season, we are looking for an entomology intern to assist us in monitoring insect life on farms. If the intern is able to stay with us for longer than 3 months, he/she will also be encouraged to develop an independent project within the parameters of our research. We welcome inquiries from graduate students who feel their projects may fit our research objectives. We would also be glad to collaborate with undergraduate students whose universities offer the opportunity for them to earn independent credits. Activities: The intern will participate in collecting and processing standardized insect samples as part of our applied farmscape ecology research. The work will involve collecting and processing insects in the field using sweep nets and malaise, vane, and pitfall traps, and will require the intern to accurately identify and count both living insects in the field and preserved insects (with the aid of a dissecting microscope) in the lab. The intern will be responsible for accurate record keeping, including data entry. He/she occasionally might also be asked to assist with horticultural tasks (e.g., work in the native plant nursery) and with on-farm habitat management (e.g., weeding in native wildflower plantings, invasive plant removal and planting of shrubs in hedgerows). He/she will have the opportunity to assist FEP staff in facilitating insect-focused educational events as well. Qualifications: We are looking for candidates with a strong interest in insects and their role in agriculture, who also enjoy the outdoors. The ideal candidate has previous experience with insect sampling and identification and is eager to further hone his/her skills, but also has a broader interest in agriculture and nature conservation, and in their potential synergies. Candidates should be comfortable living and working in a rural setting, be energetic, and thrive in the outdoors even when the going gets rough (think long hot days in a field without shade!). Given the work environment, it is important that candidates are sociable, able to interact with a diverse range of people of all ages and backgrounds, self-motivated and can work independently with attention to detail. Most importantly, we are looking for people who are eager to learn. We expect the candidates to have basic computer skills (Word, Excel) and some academic and/or work experience in field biology, field ecology, natural history, environmental science, sustainable farming/gardening, environmental education, or related fields. General Conditions: The internship is based at Hawthorne Valley Farm, a 500-acre organic and biodynamic diversified farm located in the heart of Columbia County, NY. Interns will be expected to work at least five eight-hour days (40–45 hours) per week, and will occasionally be asked to work early, late, or both, or on weekends (although we do our best to avoid such situations, the demands of our fieldwork and outreach activities sometimes make them necessary). Independent projects might require additional hours outside the regular work week. Compensation: The successful applicant will be provided with communal housing (a small apartment with a shared kitchen and bathroom) in the Farmscape Ecology Program building and a stipend of $800/month. Additional Information: Information about Hawthorne Valley Association is available at https://hawthornevalley.org; for more on the Farmscape Ecology Program itself, see https://www.hvfarmscape.org. Application Process: The interviews for the 2019 internship are under way and we are not accepting any more applications. If you might be interested in an internship in the future, please feel free to contact us. For the 2019 season, we are looking for an intern dedicated mainly to the botanical aspects of our applied farmscape ecology work and to assist with the creation, maintenance, and monitoring of beneficial on-farm habitats. If the intern is able to stay with us for longer than 3 months, he/she will also be encouraged to develop an independent project within the parameters of our research. We welcome inquiries from graduate students who feel their projects may fit our research objectives. We would also be glad to collaborate with undergraduate students whose universities offer the opportunity for them to earn independent credits. 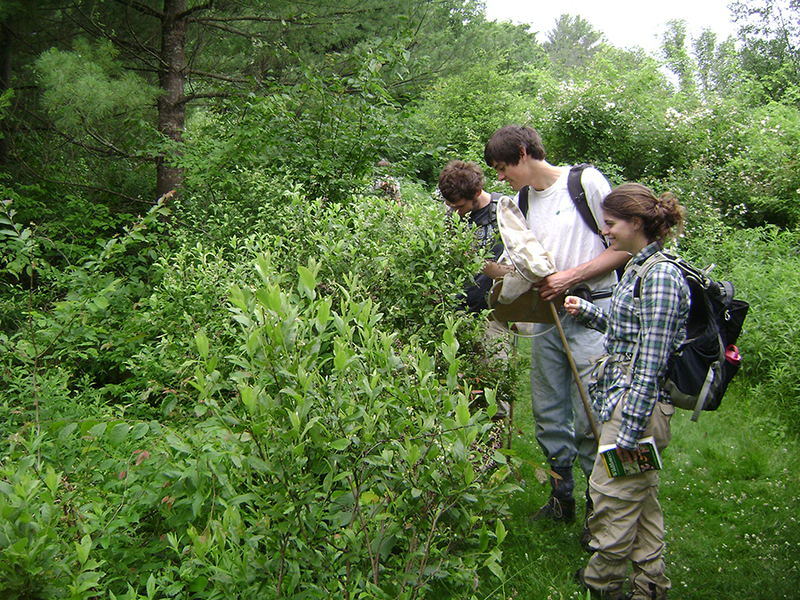 Activities: The intern will be involved in the propagation of native plants, their seeding/planting to create on-farm habitats for pollinators and other beneficial invertebrates, the maintenance of already established habitats (weeding of unwanted herbaceous vegetation and removal of invasive shrubs), and the monitoring of vegetation composition and flower abundance in select areas across the season. The botany intern is also expected to assist with insect sampling and processing of insect specimens, as needed. He/she has the opportunity to be trained and become responsible for the monitoring of the phenology trails at Hawthorne Valley Farm and is expected to keep accurate records, including data entry into the computer. Qualifications: We are looking for candidates with a strong interest in plants and gardening or agriculture, who also enjoy the outdoors. The ideal candidate has some experience with plant identification and gardening and is eager to hone his/her skills in these areas, but also excited to learn about insects and their interactions with native plants and agriculture. Candidates should be comfortable living and working in a rural environment, be energetic, and thrive outdoors even when the going gets rough (think long hot days in a field without shade!). Given the work environment, it is important that candidates are sociable, able to interact with a diverse range of people of all ages and backgrounds, self-motivated and can work independently with attention to detail. Most importantly, we are looking for people who are eager to learn. We expect the candidates to have basic computer skills (word, excel) and some academic and/or work experience in field biology, field ecology, natural history, environmental science, sustainable farming/gardening, environmental education, or related fields. The interviews for the 2019 internship are under way and we are not accepting any more applications. If you might be interested in an internship in the future, please feel free to contact us.